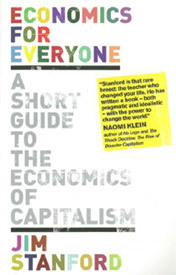 Economics for Everyone – A Short Guide to the Economics of Capitalism, by Jim Stanford, Fernwood Publishing & Canadian Centre for Policy Alternatives. We are the experts – this is the attitude with which economists spread their market gospel in the media – and working people should take market facts and inequities on faith. Jim Stanford, a staff-economist with the Canadian Auto Workers and a frequent media commentator himself, takes issue with these self-declared experts and their message. As an alternative to elite views that treat ordinary people as unknowledgeable spectators, he presents Economics for Everyone. The book title has a double meaning. It suggests that people know about the economy they are part of, regardless of whether they think about it in terms that economists use or not. The title also suggests that a connection between common sense understandings – based on day-to-day experiences at work, grocery stores, and at home – and more systematic – or scientific – ways of thinking about the economy can be made. The political implication of the book, then, is that popular economics enables main street folks to articulate and pursue their interests against bosses’ interests that are lurking behind mainstream economists’ market jargon. Before Stanford offers his own views on either improving or replacing present-day’s capitalist economies at the end of the book, readers are invited on an inspection tour. It starts at the point of production where workers produce goods and services under the command of capitalist bosses, recognizes the work that is done, mostly by women, in private households as an indispensible part of capitalist accumulation of wealth, and looks at the investment and finance strategies companies use to get, and possibly expand, their market share. This part of the inspection of capitalist economies includes the role of governments and globalization. Addressing these two issues towards the end of the book might seem a little odd since it gives the impression that capitalist economies could also develop outside of, or independently from, the world market and the international state-system. Stanford knows this is not true. In fact, he discusses different types of state as alternate possibilities to integrate into the world economy. As an alternative to improving working and living conditions in Canada he advocates a Scandinavian-style welfare state, but also considers the possibility of replacing capitalism by a socialist economy. Socialist readers will find that Stanford overestimates the room for social reform within capitalism and underestimates the destructive forces of capitalist crisis. Against the backdrop of welfare state retrenchment, including Scandinavia, over the last thirty years, and a track record of major economic and political crises every thirty or forty years, such criticism is obvious. But another, less obvious, point needs to be made. Debates about the potential for social reform versus the need for a revolutionary transformation of capitalism need room that is all but absent at this point. Stanford provides us with analytical tools and arguments for these debates but a book alone can’t create the space needed for discussion. This is a question of struggle within union locals and activist groups in workplaces and at dinner tables.